I believe that this blog post has been brewing for quite some time and there are still quite a bit of jitters pressing “Publish”. Over the years of me owning my own event planning business, I have tried my best to follow all of the rules and the advice of those that have gone before me and doing even bigger things than I am (or have). Some of those nuggets of wisdom was to “not mix personal content with your professional content” because the two are different and you don’t want to confuse your audience. I’ve tried to do that as great as I could but honestly, it was daunting. I believe that I am my brand and the things that I engage in on a daily basis includes everything that I do for my business, my clients, and even those that I love and talk to almost daily. I created my business because I 1) truly love putting on parties and weddings for my clients 2) love creating special moments and getting through the hurdles of life to celebrate something sweet and memorable. I don’t punch a clock to “start the celebrating”, I find the joy in celebrating small and large occasions quite often. I love beautiful spaces outside of event planning. I enjoy embracing the life of a work at home mom and a friend to other professional mamas. And, I value where I am today because I know exactly where I came from many years ago. I struggled with overcoming trauma from childhood and my self-esteem was very low (basically non-existent). I didn’t grow up with a silver spoon in my mouth and had to pretty much “create” the things that I wanted and work hard to shape my mindset to follow suit to what I wanted to achieve out of life. This was very difficult for me. I would have given anything to experience happiness. It seemed like a mythical concept to me. So, I tried to follow the rules of my parents, teachers, and anyone else that I viewed as being an authoritative figure. I believed that if I played “it safe” then I could get ahead and not be disappointed (or be a disappointment). And, what I discovered was me losing a part of myself along the way. I strived to rise to the expectations of those around me. I became afraid to voice my opinion, and if I did, it was with limitation. There was always a lingering “fear” of being frown upon for saying the wrong thing or saying too much. And, that was just too much for me. Over the years (particularly in my 30s), I have been able to share my story of overcoming some of my darkest days by dreaming out loud, setting achievable goals, and learning to believe in myself. And, because other women looked at my success in starting my own business and maintaining it, they often asked me questions about juggling being a wife and a mom with (at one time) working full time and operating my business part time. These private conversations fueled me and lit a spark. And, I know that it was by way of my business that I was able to connect and be open and honest about my struggles and my successes. But that wasn’t enough. I wanted to be able to be my authentic self within my business and fully connect with my audience. I wanted for you to see who it is you are calling on to design your party, create pretty stationery for you, and talk about goal setting from afar. And, I wanted (for a long time) to achieve this in one space. I don’t want my website or my social media pages to be a “portfolio” and a one way form of communication with you. I want to connect with you. I am knowledgeable in other areas besides event planning and pretty table cloths and I know that you have other desires and interests besides picking out the right flowers or vendors because at the end of the party…life still goes on. 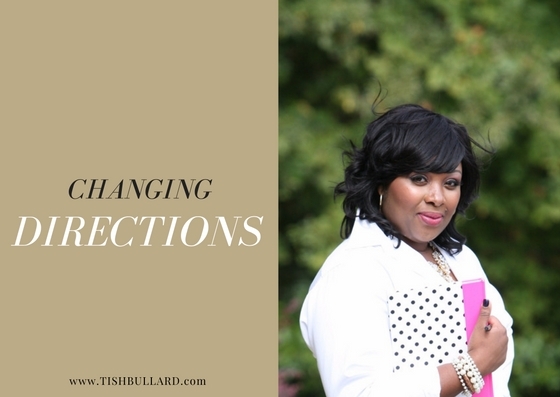 How are you changing directions? Simply put, I’m going to share more with you from my heart and soul. I will continue to post helpful tips and resources for you to plan your party or hire my team to do so. That won’t change. But, I’m wanting to add more value to our friendship. Tish Bullard Events is very well still alive and a huge part of my life so no worries there. But in addition to designing intimate events and personalized stationery, I will share planning advice, lifestyle tips and resources, business advice, personal growth information (for you and me), tutorials, and inspiration to get you going and being the phenomenal wife, mom, and business owner you can possibly be. I invite you to share this journey with me. And, I believe now that I have “come out of the closet” of being only “business focused”, I will be even more eager to blog and share with you. If you have any questions or ideas for future posts, please shoot me an email. I soooo look forward to hearing from you. Here is to the new direction of embracing life through celebrating every moment and milestone before us.